252 pages | 26 B/W Illus. 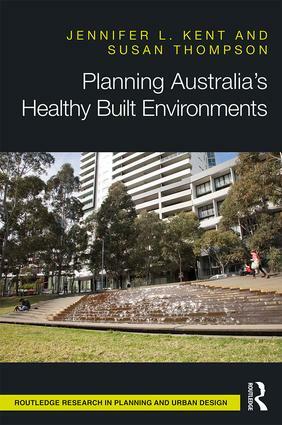 Planning Australia’s Healthy Built Environments shines a quintessentially Australian light on the links between land use planning and human health. A burgeoning body of empirical research demonstrates the ways urban structure and governance influences human health—and Australia is playing a pivotal role in developing understandings of the relationships between health and the built environment. This book takes a retrospective look at many of the challenges faced in pushing the healthy built environment agenda forward. It provides a clear and theoretically sound framework to inform this work into the future. With an emphasis on context and the pursuit of equity, Jennifer L. Kent and Susan Thompson supply specific ways to better incorporate idiosyncrasies of place and culture into urban planning interventions for health promotion. By chronicling the ways health and the built environment scholarship and practice can work together, Planning Australia’s Healthy Built Environments enters into new theoretical and practical debates in this critically important area of research. This book will resonate with both health and built environment scholars and practitioners working to create sustainable and health-supportive urban environments. Jennifer L. Kent is a Research Fellow in the School of Architecture, Design and Planning at the University of Sydney. Jennifer’s research interests are at the intersections between urban planning, transport and health. She publishes regularly in high-ranking scholarly journals, and her work is used to inform policy in Australia. Prior to commencing a career in academia, she worked as a planner both for government and as a consultant. Susan Thompson is Professor of Planning in the Faculty of the Built Environment at The University of New South Wales. Susan’s academic career encompasses research and teaching in social and cultural planning, qualitative research methodologies and healthy built environments. She has received numerous awards for her contributions to urban planning in Australia, including the Sidney Luker Memorial Medal in 2015 and the Australian Urban Research Medal in 2017. The Routledge Research in Planning and Urban Design series provides the reader with the latest scholarship in the field of planning and beyond. The series publishes international research covering spatial planning, regional planning, planning history, planning theory, communities, impact assessment, transport, sustainability and urban design. Building on Routledge’s history of academic rigor and cutting edge research, the series will contribute to the rapidly expanding literature in all areas of planning and urban design.